26th February: Unity or diversity? Which Europe do you want? 4th March: Democracy and diversity - Your Europe or mine? 11th March: Globalisation in the community - How can we shape a social Europe? 18th March: Taking it global - How can Europe change the world? 26th March: Going green - How can we save our planet? 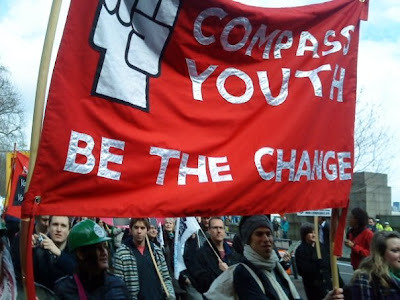 During the year Compass Youth will be undertaking a consultation in conjunction with LME LSE and the Party of European Socialists to come up with some ideas to contribute towards the upcoming PES manifesto release. Through PES Activists, the Your Space manifesto helps make connections that will keep social democratic parties in touch with the most creative, dynamic and innovative thinking in politics, but also enhance mutual understanding between activists across Europe and with our own communities. If you have any ideas feel free to leave a comment; otherwise, please attend our upcoming events. This manifesto will inspire energy and enthusiasm to the political debate and we want to share this enthusiasm and encourage it to develop within our parties and beyond, in our societies. Join us in Spain to help campaign for Zapatero! Why vote Chuka for Streatham? Who are the european citizens in London?